Islamic Revolution – Iranian people attended nationwide demonstrations on Monday in celebration of the 40th anniversary of victory of the 1979 revolution which ended six decades of Pahlavi monarchy and founded the Islamic Republic in the country. 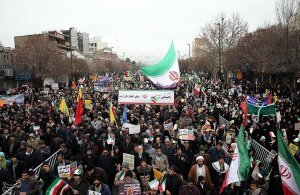 In capital Tehran, demonstrators marched across different routes to reach the Azadi (Liberty) Square, where President Hassan Rouhani gave an address. Hundreds of foreign guests, including scientific, political, and influential figures have travelled to Iran for the event, which is also a great opportunity for reporters. Hundreds of cameramen and journalists cover the massive rallies in Tehran and other cities. Iranian political and military officials have also attended the rallies along with other people to rejoice at the auspicious ceremony. The crowd of demonstrators in the rallies paid tribute to the late founder of the Islamic Republic, Imam Khomeini, under whose leadership the revolutionary movements triumphed over the despotic regime of Pahlavi on February 11, 1979. Imam Khomeini had lived many years in exile, in Iraq and France, before returning home and leading a historical revolution that overthrew Pahlavi regime. The 10-day period from the return of Imam Khomeini until the revolution’s victory is celebrated annually in Iran, and is known as the Ten-Day Fajr (Dawn).